We are proud and honored to be able to work with some great people to supply you with quality malt. Learn a little about the farmers growing your grain! I have always worked on and around farms growing up and am working to get started in farming myself. I enjoy combining all the tasks that go into successfully cultivating and growing a crop and the challenge that it presents. I'm a Purdue Agronomy grad and am a big Purdue fan. I am looking to find new ways to make a small operation viable and profitable. Malting barley may help provide and diversify my operation in order to allow that to happen. I also am a fan of craft and local beers and really any new beer I find, so I naturally have an interest in the raw ingredients, especially now since I am directly involved in growing them. I get to (partially) grow beer! Most importantly I am the father of 3 wonderful children and have a beautiful wife that supports me in all of my crazy adventures. Professionally I have spent the last 14 years involved in education. I have taught High School Social Studies, coached basketball, and I am currently a Middle School Principal. On the agriculturally side my dad and I have had bees for the past 15 years and it is this passion that moved me into farming. More importantly it is this passion that pushed me to educate myself on what our industrialized food system looks like. As a result of this I have worked to support local farmers but also grown more of the products that my family consumes. However, your kind of limited in doing that when you only live on 2.5 acres. As a result of this restriction my family and I purchased our current 145 acre farm in January of this year. My passion to grow malting grains comes from the same desire to grow, produce, and support local farming. It makes no sense to me if we are going to eat local, brew local, but not grow local ingredients. Owner of Little Miami Farms since 2002 growing corn, soybeans and hay. Began growing hops in 2014 and barley in 2015. My grandparents bought this 80 acre farm in the late 60's where they raised cattle, horses and hay. They ceased raising cattle and began growing row crops in the early 90's while continuing with the horses. Grandpa also used part of the farmto grow mums he would sell as well. They sold 25 acres to help with home improvements when they retired and stopped working horses at that time. In 1995 we lost my papaw; that is when I received my part of the farm. My Dad and Aunt helped my Grandma with the farm along with a neighbor and his son that had been farming the row crops for them. In 2008 we lost Grandma so the farm was shared between my Dad and Aunt until a few years ago when my Aunt decided she would turn her interest over to my Dad. Since then my Dad has consulted with me more on ways that we can potentially increase the income for the farm. I have been helping along the way on this farm ever since I was a child and my wish is to keep the farm going which has lead us to the decision to expand our crop options and to start raising some livestock again. We've decided this year to plant 2 row Full-Pint barley after my fiancé and myself attended Sugar Creek Malt Co. Information Meeting. Our intrigue and taste for locally brewed Indiana Craft Beer is what sparked our interest of becoming a supplier of locally grown barley as well as hops. The option of growing barley and being able to expand our crop options while implementing "green" farming practices fulfills our desire to maintain and continue our legacy of a small Indiana family owned farm. 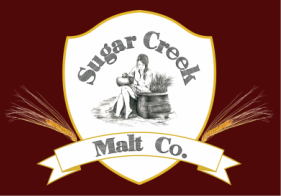 We at Sugar Creek Malt Co. do raise our own grain on our family farm, but we are always looking for more farmers who would like to grow unique malting grains! Spreading out our farmers will reduce our risk of weather related issues as well as help boost the economy of the local rural community. If you are interested or want more information please go to the contact page and submit the contact form or simply email us at caleb@sugarcreekmalt.com. We can give you all the information to help you start raising quality malting grain!